Available now on Steam, Kalypso or Xbox. El Presidente, I do not wish to be the spreader of alarm, but would you kindly put on this lead-lined suit? Only the highest quality for you, o munificent one, but it's just that we're slightly concerned, here in Tropico 4, that nuclear missiles - yes, your Chekov impression is very funny, Most Grand High - are about to arrive, in the Apocalypse DLC. Your loyal citizens would rather not glow like the bunnies, el Presidente, that's all I'm saying. The Cold War's gone a bit pear-shaped in Tropico 4, and now your happy-go-lucky Capitalists, Communists, Religious and all the rest are about to learn what life will be like post-Strangelove. The hazmat suit may be your salvation, as will those nifty new Nuclear Shelters, and you get the new Survivalist trait to help your citizens survive with less food. There's even a new doomsday scenario for you to endure. All this for $4.99, and your sanity. After all, it's a MAD, MAD world. 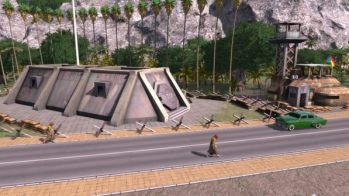 Tropico will get a new lick of paint next year in Tropico 5. Until then, why not make sure your loyal citizens lead happy, mutation-free lives? Except for those stinking Rebels, of course. Who cares if they grow extra heads? Apocalypse is out now on Steam, Xbox Marketplace and via Kalypso's own site.